Michael McFadyen's Scuba Diving - Xanadu Reef We discovered this reef in mid-2002 on the way back from Magic Point Sharks to Port Hacking. 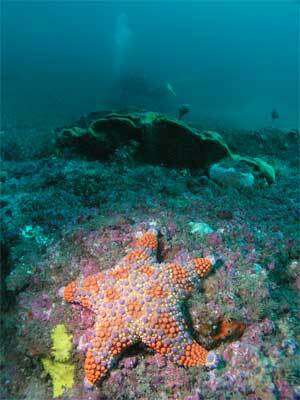 Since it is located not far from the sewage treatment outfall at Potter Point, Kurnell, we had never been really interested in finding new dive sites in this area till 2002. The thing that changed our mind was the new treatment plant brought on line in late 2001 or early 2002 that provides tertiary treatment. This means that the water is much cleaner than before (it used to be brown and smelly) and so the dive site is now much more attractive to divers. This dive site consists of a north-south running wall that drops from 26 or 28 metres (depends where you are) to 33 below the wall and 35 metres a bit off the reef and almost 37 metres further away. From Port Hacking, turn left once you hit open water and head for Cape Baily Lighthouse. From Botany Bay, turn right and travel past the lighthouse and then head towards Cronulla. The GPS reading for the site is a latitude of 34⁰ 03' 00" S and longitude of 151⁰ 12' 07" E. Note that all the GPS Readings on my Web Site are taken using AUS66 as the map datum. If you use another datum you may be about 220 metres off the wreck. See my GPS Page for more details and how to convert readings. Once you arrive at the site, run east or west until you pick up the wall and anchor on the top in a westerly or on the deeper area if an easterly or north-easterly wind is blowing. As this site is located only 350 metres or so from Voodoo Reef, we named it Xanadu to rhyme as well as because of the Greek mythological Xanadu. As mentioned, there is a very good wall that drops from at least 28 metres to 33 metres and then slopes away to 35 metres. The reef top is basically flat with little to see away from the edge except for a lot of kelp. The bottom is sand and the slope lots of small boulders. In some spots the wall drops right to the sand, although the depth may be a little shallower. On there sand in spots there are some smaller boulders. Head either north or south along the bottom of the wall. Look under the many overhangs for fish and on the sand for things like rays and flatheads. Once you have gone about 8 minutes, go top the top of the wall and return back to the anchor. If you have any time left once you get to the anchor, have a quick look the other way. The reef appears to run for a while north but to the south it appears to turn a bit to the west (I think). 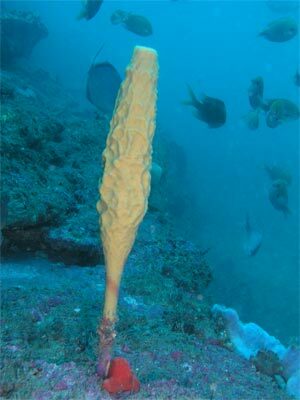 The wall has a few gorgonias on it and some nice sponges, sea squirts and other fixed marine life. On our dives here we have seen lots of silver sweep, yellowtail, ladder-finned pomfret and one-spot pullers over the reef. We have also found sea spiders and Sydney pygmy piephorses at this site. As I mentioned, the top of the reef near the edge is also interesting and at the end of the dive worth exploring before you ascend. Due to the depth, this is only for the more experienced diver. Again, due to the depth you will only get between 15 and 18 minutes before you go into decompression. Because of the depth, you will need to dive here many times to fully explore the whole area. Unfortunately, as far as I know, no charter boat operates to this site, so you will need a private boat to dive here.